PAINTING AT THE PARK, presented by D-backs Club Series Wine: Fans were able to purchase a special package that includes a private paint session, hosted by Paint, Party & Wine, game ticket in the PetSmart Patio, a D-backs Sedona Red wine tasting and all-you-can-eat food. 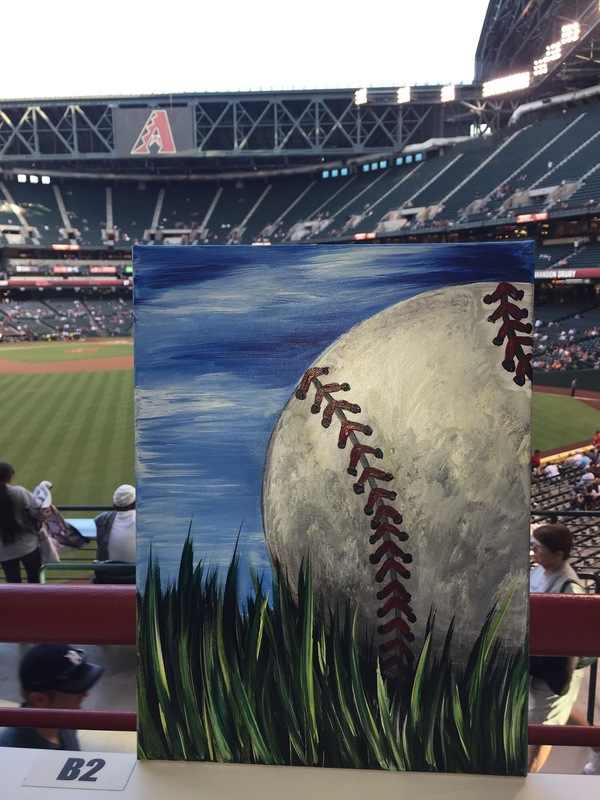 Fans will learn how to paint baseball-themed artwork. The event is sold out but additional dates have been announced and can be purchased at dbacks.com/paint. PROSTATE HOME RUN CHALLENGE: In honor of Father’s Day on Sunday, June 18, and as part of the League’s ongoing efforts to raise awareness for various forms of cancer, the D-backs will have Prostate Cancer Foundation Founder and Chairman Michael Milken throw out the ceremonial first pitch. MLB fans are encouraged to visit HomeRunChallenge.org to pledge a donation for every home run hit during the 2017 campaign. Fans can also make a simple one-time donation and sign up to receive more information about prostate cancer. Each home run hit in all games beginning Thursday, June 1 up to and including Father’s Day, June 18 will raise money to fight prostate cancer. More details are available at dbacks.com/throwback. MATINEE GAME: Matinee pricing available and includes a discounted ticket as low as $12. For more info, visit dbacks.com/matinee. GIRL SCOUT NIGHT AND SLEEPOVER: The D-backs will host Girl Scouts for a sleepover at Chase Field immediately following the game. Girl Scouts will enjoy postgame activities including, Zumba, Gamez on Wheelz and a movie in HD on dbTV from the comfort of a sleeping bag on the field. The Girl Scouts will earn a special patch for participating in the sleepover. The D-backs will also recognize the Girl Scouts in a pregame parade around the warning track. RJ51 “HALL OF PHOTOS” PHOTOGRAPHY EXHIBIT: D-backs Legend and Hall of Famer Randy Johnson will showcase his photographic works to select Season Ticket Holders and Suite Holders beginning at 5 p.m. in the Legends Suites & Conference Center at Chase Field. Those in attendance will have the opportunity to purchase Randy’s personal artwork at the event, with a portion of the proceeds benefitting the Arizona Diamondbacks Foundation. NATIVE AMERICAN RECOGNITION DAY presented by GILA RIVER CASINOS: The D-backs will recognize several of Arizona’s Tribal Royalty contingent during a pregame ceremony and will have traditional song and dance groups on site that will perform throughout the ballpark and on the field before the game. Festivities begin at 5:00 p.m. and include Native American drum groups, dancers, vocalists, artisans, educational exhibits and more. Miss Gila River, Anissa Garcia, will throw out the ceremonial first pitch, Bob Villa will sing the national anthem and color guard will be posted by Haskell Osife Antone American Legion Post #51. In addition, for those who purchase tickets using the promo code NARD at dbacks.com, $2 from each ticket will benefit the Phoenix Indian Center and the Inter Tribal Council of Arizona. For more information, visit dbacks.com/nard. D-BACKS INTER-TRIBAL BASEBALL & SOFTBALL TOURNAMENT RECOGNITION: The D-backs will recognize the top four teams in each division and pass out trophies to the team MVPs and championship teams during a special pregame recognition. More than 1,300 participants from the tournament will also participate in a pregame parade around the field. FRY’S DIAMOND DAYS PROGRAM: Fry’s Food Stores and the USO will treat more than 200 military members and their families from Davis-Monthan Air Force Base. D-BACKS EXPRESS: The D-backs offer a hassle-free way to see a D-backs game for fans in Tucson. A luxury bus will pick up fans at the Foothills Mall in Tucson and drops off fans in front of Chase Field, with a guarantee to receive that day’s giveaway item. Round-trip fares are $25 per person and leaves three hours before game time. For more information, visit dbacks.com/express. BAXTER’S BIRTHDAY, presented by PetSmart: Several local mascots will join Baxter to help celebrate his birthday. Baxter and friends will greet fans at the doors from 11:30 am. - 12:00 p.m. and will be introduced prior to first pitch. All mascots, including Baxter, will sign autographs in the 4th inning at Baxter’s Den in the Phoenix Children’s Hospital Sandlot. Fans will also have the chance to sign a birthday card for Baxter throughout the game. Fans can also celebrate in La Terraza with piñatas and face painters. PITCH, HIT AND RUN: The D-backs will host a skills competition for kids ages 7-14 to show off their pitching, hitting and base-running skills from 7-9 a.m. at Chase Field. DOG DAYS OF SUMMER: Fans can enjoy the game with their canine friend from the PetSmart Patio. Fans can use the new PetSmart Dog Park and treat their dog to doggy concession favorites such as doggy ice cream. PetSmart will also have adoptable dogs on site for fans to find a forever home for the pups. For more information, visit dbacks.com/dogdays. CHEVROLET ARIZONA ALL-STARS: The D-backs will recognize youth sports leagues in a pregame parade around the field. The event also serves as a fundraiser for youth sports teams. Last year, the program raised more than $55,000 that went back to Little Leagues across the state of Arizona. COLD STONE KIDS SUNDAYS: Each Sunday home game, one winner is selected to deliver the lineup card to the umpires with a D-backs coach before the game and deliver Cold Stone Ice Cream to the D-backs’ broadcast booths. SUBWAY KIDS TAKE THE FIELD: Kids ages 7-15 can enter for the chance to “Take the Field” with D-backs players at every Sunday home game prior to the National Anthem. SANDERSON FORD CRONISTA INFANTIL: The D-backs and Sanderson Ford will host the next Cronista Infantil as a guest on the D-backs’ Spanish radio broadcast alongside Oscar Soria and Rodrigo Lopez during the game. Kids ages 10-14 are encouraged to sign up and audition to become the next Sanderson Ford Cronista Infantil by visiting losdbacks.com/cronista. D-BACKS KIDS CLUB, presented by Danzeisen Dairy: The Kids Club is a free program for kids 15 & younger that rewards members with prizes for each game they attend, including a complimentary ticket to Sunday home games. Fans can register at Chase Field in the Phoenix Children's Hospital Sandlot, or online at dbacks.com/kidsclub. D-BACKS INTER-TRIBAL BASEBALL & SOFTBALL TOURNAMENT – June 7-10: The D-backs will host their 19th annual Native American youth baseball and softball tournament with games played throughout the Salt River reservation and at ballparks around the Valley. More than 1,300 participants, including 76 teams, will travel from five states (Arizona, New Mexico, California, Mississippi and South Dakota) and represent more than 36 tribes and for many this will be the first time leaving their tribal reservation. For more information, visit dbacks.com/intertribal. BIKE SAFETY EVENT – June 9: The D-backs and Safelite AutoGlass, in partnership with Phoenix Fire and Sonoran Cycle, will give away free bikes and helmets to the members of the Boys & Girls Club Gabel Branch from 11 a.m. – 1 p.m. as part of the D-backs Safelite Summer of Safety Program. Phoenix Fire and Police will also be on site to instruct kids in safety drills. LITTLE LEAGUE TAKEOVER – June 10: The D-backs will take over the Inter-Tribal Youth Baseball (ages 9-12) Championship game at 10 a.m. at Salt River Recreation Center. Several D-backs including Baxter, D-backs Organist Bobby Freeman, D-backs Racing Legends, Rally-backs, D-backs PA Announcer Chuck Drago and front office employees will “crash” the Championship game. The festivities will include celebrity coaches, an official in-game announcer, and other elements that fans would see at Chase Field, such as the Hot Dog Race, T-shirt Toss and singing of Take Me Out to the Ballgame. D-BACKS ACADEMY CAMPS: The D-backs Baseball Academy offer Youth Camps around the state of Arizona in June and July for boys and girls ages 6-14 and include baseball/softball fundamentals training, a D-backs T-shirt and cap, and free ticket to a 2017 home game with the opportunity to purchase additional tickets at a discount. For more information and to register, visit dbacks.com/academy. ALL-STAR VOTING: All-Star voting (#VoteDbacks) is now underway through June 29 and fans are encouraged to vote for their favorite D-backs players at dbacks.com/vote. LA TERRAZA: Fans can enjoy a Latin vibe in the Upper Right Field Concourse at every Friday, Saturday and Sunday home game, which includes specialized décor, Latin music and authentic regional food from local favorites such as El Güero Canelo. For more information, visit dbacks.com/laterraza. D-BACKS LICENSE PLATES: fans will have the opportunity to purchase the official D-backs license plate during each D-backs Saturday home game. The Arizona Department of Transportation will have a table on the main concourse at section 132 where fans can purchase or renew their D-backs license plate. Fans that purchase or renew their D-backs license plate at the game will also receive a limited-edition D-backs license plate t-shirt. The D-backs license plate costs $25 and $17 from each plate benefits the Arizona Diamondbacks Foundation. To date, more than $1 million from D-backs license plates has been donated to education initiatives across Arizona. For more information visit dbacks.com/licenseplate. D-BACKS AUTHENTICS: The D-backs sell game-used and authenticated merchandise ranging from game-used bases, jerseys, bats, balls and lineup cards to autographed merchandise. Net proceeds from D-backs Authentics sales benefit the Arizona Diamondbacks Foundation. D-backs Authentics will be located at section 134 on the main concourse or on Twitter @DbacksAuthentic. D-BACKS BASEBALL ACADEMY YOUTH CLINICS: D-backs Baseball Academy coaches will host two free clinics for kids at Futures Field located in the Phoenix Children’s Hospital Sandlot at each D-backs home game starting one hour before first pitch and at the end of the fourth inning. SINGLE-GAME TICKETS: D-backs single-game tickets start at just $15 on select game days and are available online at dbacks.com/tickets, by phone at 602.514.8400 and in person at the Chase Field Ticket Office, Monday-Friday from 9:00 a.m.-5:00 p.m. and on non-gameday Saturdays from 9:00 a.m. -5:00 p.m.
ALL-YOU-CAN-EAT SEATS: Located in the Diamond Level, tickets range from $39-$45 and include unlimited hot dogs, chips, popcorn, peanuts, Pepsi products and Aquafina water. For more information, visit dbacks.com/ayce. D-BACKS VALUE PACK: Ticket packages start at $25 and includes a game ticket, one hot dog or SUBWAY sandwich, 24-oz. Pepsi and a coupon for a free SUBWAY® Restaurants cookie. For more information, visit dbacks.com/value. STUDENT PASS: Students will get discounted tickets, including tickets as low as $5, for select games through the Student Pass program. The offer is activated by texting STUDENT to 76925. MILITARY AND FIRST RESPONDERS DISCOUNTS, presented by GEICO: The D-backs and GEICO will offer discounts on single-game ticket prices for all military active duty, reserve, retired and veterans, as well as active or retired fire and police personnel with valid ID, including 50 percent off every Sunday and up to 35 percent off on select games. All-You-Can-Eat tickets are excluded from this offer and can only be redeemed for up to four tickets. For more information, visit dbacks.com/military.